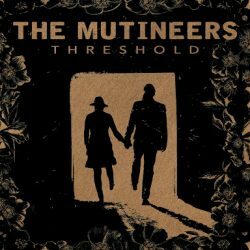 The Mutineers are a rock’n’roll duo from Portland comprising guitarist/singer Brian Mathusek and drummer/singer Merry Young. Their influences range from Springsteen, late 60s Elvis Presley and Loretta Lynn. They have played over 120 shows across America and their new 5 Track EP ‘The Threshold‘ is a follow up to their ‘Live at B-Side‘ album. If you like the harder/punkier side of Americana Music then you might just enjoy this. Clearly there is a strong Jack White/PJ Harvey influence throughout this enjoyable EP. ‘Hard Sell’ swaggers as the opening track with some grungy riffing that hears Mathusek snarling “Love is an evolution, can’t put my finger on it, a terrible condition – a Hard Sell”. I must say their loose harmonies are really quite contagious and often endearing. The Elvis Presley influence can be heard clearly in ‘Couldn’t Get Over You’ with Young taking over the lead vocals here, treating us to a killing opening line “I love you I hate you that’s the way it is, can’t believe we’ve made it this far”: no Keith Urban romanticising here! Really strong, real and earthy. ‘Afterthought‘ is dark affair, not dissimilar to early Nick Cave with a definite twist of Johnny Cash thrown in. The track has mysterious, threatening undertones: “If you take my heart for granted I might not be there when you’re gone”. The duet ‘I’ve Got The Bottle’ has lovely drunken barroom charm that’s reminiscent of Lucinda Williams and Elvis Costello trading blows on ‘Jailhouse Tears‘. The added keys and pedal steel on this song really fills their sound, which on previous tracks consisted of a slightly bare drums/ guitars combination. These are strong songs that deserve a listen. Enjoyable stuff.